A few weeks ago, Cherry Culture tempted me with another 20% off sale (I think it was 20%, I can’t remember exactly)… anyway, my goodies arrived at the end of last week, packaged impeccably (as always). Have you been partaking in any hauls in the run up to Christmas or are you being good and spending your money on presents for other people? wow love the colors. i was tempted so many times to shop at cherryculture but i hold my horses ,, err how do i resist more. i also wanna get one of these jumbo pencils? Love the look of that middle gloss. I think it was sold out when I tried to order it duirng the 50% off sale in April. Wicked haul hunny. Love NYX. Ive been good and spent all my pennies on other people. Think Its about time I got a treat though.. hehe. Haha I’ll be over that soon I promise. But those lipsticks seem very appetizing! Mmhmm, I could do with a nice haul like that. And maybe a few more, too. Need to extend the wishlist! Those NYX shades look nice, they would appeal a lot to my mom, she loves gold and silver metallic colours. She hates purple though, with a passion… and it’s my favourite colour. NYX is my favorite! sparkle cedar looks lovely! I love NYX. I just bought the chrome eyeshadow bundle from the NYX website for myself, as well as a few jumbo eye pencils I was missing (or needing a refil of). As far as hauls go, I have been horrible! I buy just as much for myself as I always have, plus the gifts on top of it! Im pretty close to broke lately, haha. Wow, that is SUCH a bargain!!! 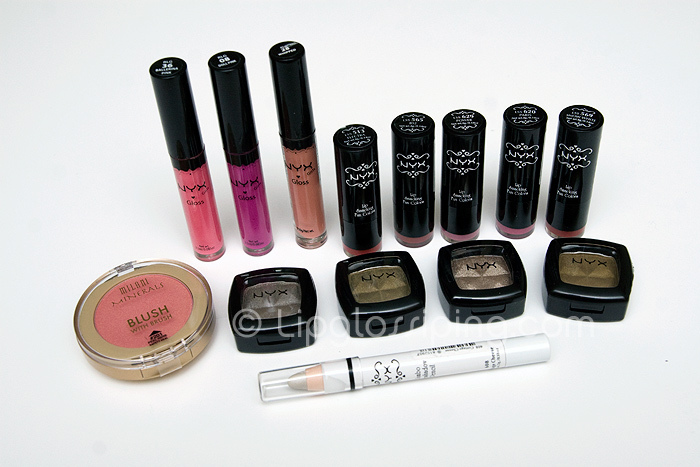 I really love NYX products, although I only have a few bits. I love love love the look of sparkle cedar, and the lighter pink lipgloss. Oh and I’ve seen herb e/s used in a tutorial on youtube, it was really pretty. Can’t wait to see swatches! !